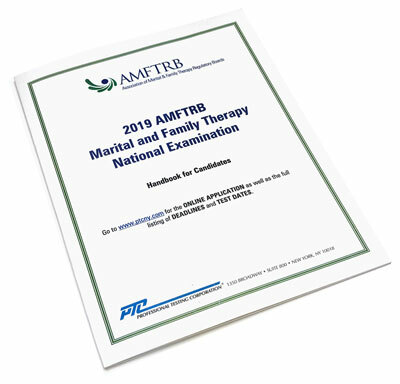 The National Marital and Family Therapy Examination is administered via computer. Candidates have the opportunity to take the Exam during one week per month at testing locations offered through PSI. Candidates must first contact their jurisdiction, or the state board for the state in which they intend to practice, for applications and eligibility requirements. 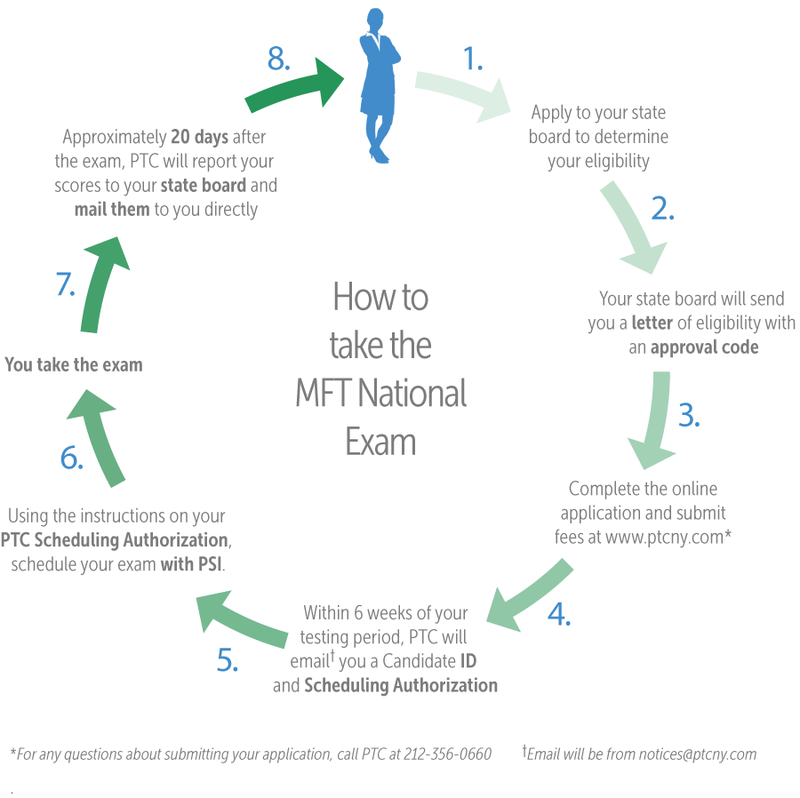 After the jurisdiction has approved the applicant to sit for the Exam, the jurisdiction will email an Approval Code and link to the PTC online application system. If you feel you qualify for ADA Accommodations under the Americans with Disability Act, please complete the linked form. If you need considerations as an English Language Learner please download, complete ELL Special Arrangements, and submit to your jurisdiction. Candidates are required to complete an online application for PTC/AMFTRB. The candidate will receive an email notification of the online link for this application only after the jurisdiction (state board) in which the candidate has applied for a license has sent your Approval Code. Once the PTC/AMFTRB application is completed and the examination fee has been received, candidates will receive an identification number and information concerning the testing centers. Candidates will be instructed to contact PSI directly to schedule their examination location, date and time. Please contact your state jurisdiction directly with any questions concerning application deadlines and additional fees for licensure and application. Your jurisdiction may have additional requirements that may supersede the ones outlined above. Score Reports are sent via a secure link, not in the body of the email. Your Score Report is password protected. Your Candidate ID serves as the password to open your Score Report. Your Candidate ID can be found on your Scheduling Authorization. The link to download your Score Report is valid for 30 days from the date you receive the email with the Score Report. Please download your Score Report within 30 days and print or save a copy for your records. Your Score Report remains password protected even after you download and save a copy on your computer. Please save your Candidate ID. To access your Score Report after 30 days, you will need to contact PTC at support@ptcny.com to request a new link. Requests made more than 6 months from the date of this email are subject to a $25 Duplicate Score Report fee.